We often have some data that we have obtained in the lab, and we want to solve some problem using the data. For example, suppose we have this data that describes the value of f at time t.
1 Estimate the value of f at t=2. This is a simple interpolation problem. The function we sample above is actually f(t) = exp(-t). The linearly interpolated example is not too accurate. we can tell interp1d to use a different interpolation scheme such as cubic polynomial splines like this. 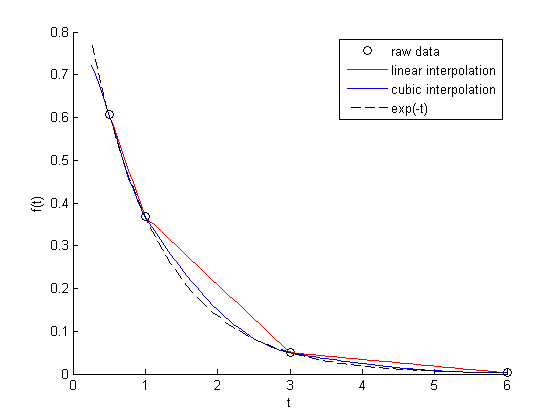 For nonlinear functions, this may improve the accuracy of the interpolation, as it implicitly includes information about the curvature by fitting a cubic polynomial over neighboring points. Interestingly, this is a different value than Matlab's cubic interpolation. Let us show the cubic spline fit. Wow. That is a weird looking fit. Very different from what Matlab produces. This is a good teaching moment not to rely blindly on interpolation! We will rely on the linear interpolation from here out which behaves predictably. It is easy to interpolate a new value of f given a value of t. What if we want to know the time that f=0.2? We can approach this a few ways. We setup a function that we can use fsolve on. The function will be equal to zero at the time. The second function will look like 0 = 0.2 - f(t). The answer for 0.2=exp(-t) is t = 1.6094. Since we use interpolation here, we will get an approximate answer. We can switch the order of the interpolation to solve this problem. An issue we have to address in this method is that the “x” values must be monotonically increasing. It is somewhat subtle to reverse a list in python. I will use the cryptic syntax of [::-1] instead of the list.reverse() function or reversed() function. list.reverse() actually reverses the list “in place”, which changes the contents of the variable. That is not what I want. reversed() returns an iterator which is also not what I want. [::-1] is a fancy indexing trick that returns a reversed list. In this case you get different errors, one overestimates and one underestimates the answer, and by a lot: ± 20%. Let us look at what is happening. You can see that the 1/interpolated f(x) underestimates the value, while interpolated (1/f(x)) overestimates the value. This is an example of where you clearly need more data in that range to make good estimates. Neither interpolation method is doing a great job. The trouble in reality is that you often do not know the real function to do this analysis. Here you can say the time is probably between 3.6 and 5.5 where 1/f(t) = 100, but you can not read much more than that into it. If you need a more precise answer, you need better data, or you need to use an approach other than interpolation. For example, you could fit an exponential function to the data and use that to estimate values at other times. So which is the best to interpolate? I think you should interpolate the quantity that is linear in the problem you want to solve, so in this case I think interpolating 1/f(x) is better. When you use an interpolated function in a nonlinear function, strange, unintuitive things can happen. That is why the blue curve looks odd. Between data points are linear segments in the original interpolation, but when you invert them, you cause the curvature to form.